For those who have been following you will know that I have recently embarked on a three part review of Puppy Linux. For those who haven’t been following, I have recently embarked on a three part review of Puppy Linux. In the previous reviews I looked at Wary and Slacko. In this third review I am looking at the best of the bunch which is Lucid Puppy. The rest of this post will explain why I think Lucid outshines both Wary and Slacko and I have a confession to make that will make a lot of people shout “What? you have to be kidding”. All will become clear as time goes by. Ok so I had a few issues when I first tried Lucid Puppy. I had downloaded the iso and tried to burn it as an image to a USB drive. The second attempt I tried to use UNetbootin. Again upon reboot the system would not load. You can ignore these because….. I downloaded Lucid Puppy again from the Puppy Download page and when I burned to disk this time the system booted successfully. Therefore I put attempt 3 down to a dodgy download. For those of you wondering why I haven’t put attempts 1 and 2 down to a dodgy download as well then the answer is that really this should go down as attempt 6 because I tried attempts 1 and 2 again. In other words burning straight to USB and UNetbootin on this occasion let me down. 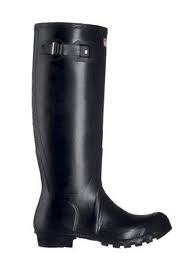 Now I’ve tried all three of the puppies I can honestly say there isn’t much difference in the boot time. Booting from CD with a save file takes approximately 2 minutes on my laptop. (Samsung R20 with 2 gb of ram). On a more modern machine it might boot faster and obviously with a hard drive install it would boot much faster. I don’t believe Puppy is a system for installing to your hard drive. It was built to run from memory and from removable media. This is where Lucid Puppy beats both Slacko and Wary hands down. In all three reviews I have attempted to connect to the 3 mobile broadband network using the MIFI device. For both Wary and Slacko although I got there in the end the process of connecting to the net was very cumbersome. With Lucid a window popped up as soon as I booted the first time with my ethernet and wireless cards detected. When I click the wlan button both my home broadband and three broadband were selected automatically. All I had to do was enter the WPA key and I was connected. After connecting to the internet obviously the first thing you want to do is browse. Now there are icons on the desktop and there is a menu button. For some reason I chose the menu button and clicked the internet menu and could not find a browser. Stupid move. Had I clicked the browse icon on the desktop all would have come clear very quickly. A menu appears asking which browser you would like to install. 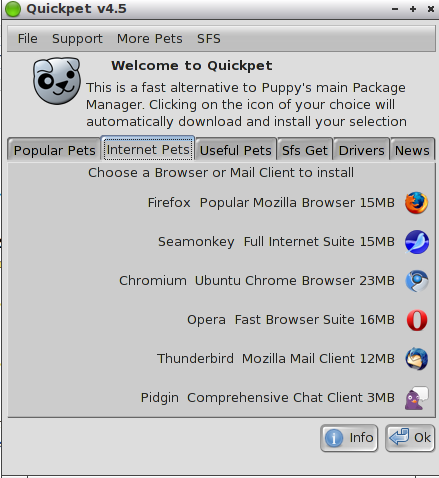 The options include SeaMonkey (which is the defauly Puppy browser), Firefox, Chromium and Opera. So which of the browsers did I decide to install. Well Chromium is my favourite browser but out of the listed items it takes up the most space at 26 mb. The others were all around the 15 or 16 mb mark. I’m going to say something now and it is not to make myself notorious or to cause offence to millions of people worldwide. Are you ready? There it is. I have said it. Now of course I need to qualify why I have never liked Firefox. For years there was a battle raging on the net about which was the best browser and a bit like LINUX in general there were those singing the praises of Internet Explorer and those that sang the praises of Firefox. Now we all know Internet Explorer is bad. Why is it bad? It is bad because for years web developers have had to write workaround after workaround trying to get their web pages to work under both Internet Explorer, Netscape Navigator, Firefox, Chrome, Safari and Opera. What is worse is that even different versions of Internet Explorer would show the page in a different style. That is just one reason for not liking Internet Explorer and has nothing to do with Firefox. The other reason for not liking internet explorer is toolbars. Within Windows no matter what piece of software you install you will be asked whether you want to install a toolbar. What is worse than that is that the checkboxes are checked by default so if you do not read the text properly you will acidentally install that toolbar and so eventually you could end up with 6 or 7 toolbars taking up half the screen. Again you might ask what has this got to do with Firefox. Well….. undoubtedly Firefox fans will say that its strongest feature is the number of add-ons and plugins that you can get for Firefox. This has always bothered me and I was delighted when Chrome came out. Sure I could have just kept the base install and not installed any add-ons but the problem is still the same. Firefox has too many menus and takes up too much of the screen. Chrome and Chromium were just what I was looking for. A minimalist browser that just let me search and browse. Back on track then the browser I ended up installing was Opera. I’ve always quite liked it and it was built for loading into memory in the same way Puppy does. I am typing this article using Opera and it works just fine. With Wary and Slacko after connecting to the internet I was offered the opportunity to install flash. With Lucid this option did not appear. To install Flash using Lucid I had to select the menu button and then from the internet menu there is an install flash icon. Another really useful feature in Lucid Puppy is the Quickpet application. This is simply a tabbed application which has links to install the most common and useful packages for Lucid Puppy. The list of applications highlighted are virtually all the applications I might use without having to go into the main package manager. Puppy linux uses a save file to store data. When you reboot for the first time you are asked whether you want to create a save file and where you want to store it and how big is it going to be. One thing I noticed in Lucid is that unlike the graphical tools used by Wary and Slacko this one seems to go back in time and show a blue screened background and almost a dos like set of menus. 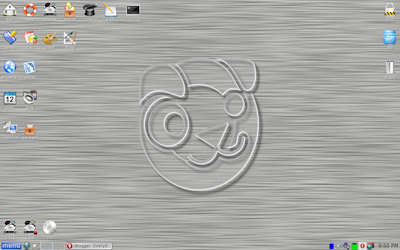 The desktop for Lucid Puppy is very similar to that of Wary and Slacko. In the top left of the screen are five rows of icons. At the bottom of the screen is a toolbar with a menu button, taskbar icons and in the bottom right a system tray. Above the menu are icons for each of the drives connected to your machine. Finally on the right hand side are icons for locking the screen. zipping files and a trash can. There is nothing majorly different between Lucid, Wary and Slacko with regards to the desktop and by and large the default applications installed are the same. The background for Lucid is a plain gray colour which isn’t very inspiring but that can easily be changed. Lucid is the best of the three versions of Puppy that I have reviewed. It is more polished than the other two and just small things make it so much better. Connecting to the internet is a basic requirement and Lucid gets it perfectly. Only 2 screens and I’m connected. Wary and Slacko required much more effort. 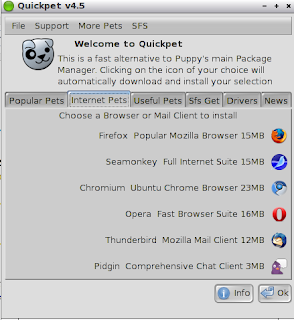 Installing commonly used applications via the Quickpet menu is brilliant. I think all distros could consider implementing this. A choice of browsers is available for installation as opposed to being stuck with the default SeaMonkey. (Ok to be fair Wary and Slacko enable you to download PETs for other browsers). Lucid has the ability to rival Bodhi as a lightweight distro although given the choice I would still say Bodhi edges it. You are writing very well. Its a good informative blog for Linux beginner. Lucid is a great Puppy! One more point for Lucid: It can use ubuntu repos, which means thousands of apps more than Slacko. Thank you for reminding me about Bodhi, and for your efforts for making this review for us. There is an easier way to create a bootable USB drive, and one can do it manually in < 5 mins. Go to the puppylinuxworld channel on youtube, and look for a tutorial. It is quite easy, although at first, one may find it challenging. Use Grub4dos as the bootloader. Basically, partition and format the USB stick with Gparted (built in utility in Puppy), and create a partition (Ext4) for puppy files and then create an optional swap partition. Make sure you make the puppy partition bootable while in Gparted by right clicking the partition, click manage flags and tick the boot box. Create a subdirectoy in the puppy partition and give the name of the puppy distro (e.g. lucid528). Click on the puppy .iso file, either on the burned CD, or on the hard drive if one has downloaded it, and copy the files into the puppy subdirectory. Then, run Grub4Dos. Done. After doing this a couple times, it can be done very quickly. As far as Slacko, there is an option to installl the Frisbee wireless utility, which makes connecting to a network a breeze. Go to menu – setup – internet connection wizard – wired or wireless LAN – Frisbee. Slacko recognized a generic ralink-chipped wireless N USB dongle whereas Lucid 5.2.8 did not, so I give Slacko a slight edge. I have an older Netgear Wireless G dongle that works out of the box with Lucid. Lucid 5.2.8 has Frisbee included as well. It was easier than the other 2 wireless utilities. My boot time on a 4-5 yr old Dell dual core with a frugal install is about 15-20 seconds once I select Slacko on the boot menu. I multiple boot various OS's. Flash is easily installed. Go the the puppy linux forums (link on puppylinux.org page), and download the latest .pet. Go to additional software – browsers and internet, there is a thread for the latest flash. I use both Slacko 5.3.3 and Lucid 5.2.8. I like both of them about equally. I don't have any experience with Wary. I use Puppy ~ 99% of the time at home. Every now and then, I have to use Windows to run my scanner. I've been too lazy to setup the scanner on Puppy. Incidentally, I sold one of my computers this weekend and reloaded Windows XP. What a pain. It took about 40 minutes to load/install it from the CD, then I had to install a bunch of drivers. Puppy is much simpler. A frugal install can be done in ~ 5 minutes, and maybe another 30 minutes to customize it. That is a really good comment. Thanks for this. I did try Frisbee but it wasn't very successful with the 3 mobile broadband. I will try the USB suggestion you have made to see if that solves the problem I had. Windows XP was a good operating system. The fact it has lasted so long is a good mark to say how popular it was. You are right of course that now it is a pain to install Windows XP because you have to install the software, find all the drivers and install up to service pack 3.
im using lucid puppy 5.0.1 dual boot frugal inside windows xp, because i got modem error 633 in xp and i couldnt solve it. Then lucid puppy is very easy to configure usb evdo modem, install wine and use firefox from xp. Thanks Gary for these well written informative reviews! I run Lucid 5.2.8 puppy on this computer as a full installation to the Hard Drive. DRAM size is 640 Megabytes. (Puppy runs well with 256 Megabytes). I have used KINOdv that I compiled on PuppyLinux 4.1.11 to edit my minDV Digital Video movies. I like having the Puppy__devx.sfs files that gave me a development environment. Really quite satisfied with Puppy Linux, because it is fast, stable, looks good, and comes in a small package!! 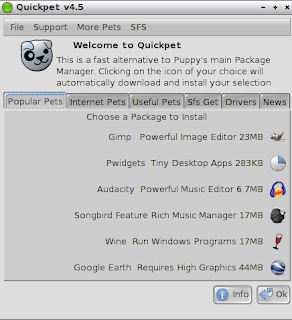 Puppy Linux download image file is about 130Megabytes. It installs into under 500Megabytes Hard disk file space. In comparison a Linux Mint 9 install takes about 3.2 Gigabytes of Hard disk drive space. Yes Linux Mint is smooth and wonderful to use, but I prefer Puppy Linux because it is snappy! 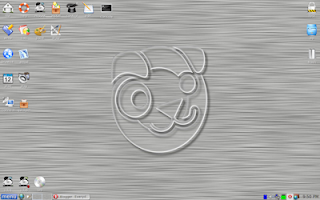 Test PuppyLinux on your PC with either from a CD-ROM disk or from a USB Flash Drive. 3 Puppy websites to look at. http://liinuxliveusb.com Has over 360 Linux distributions that can be installed to a USB Flash, by downloading the .ISO file from the internet. Complete 4 very easy steps to have a bootable USB flash drive with Puppy or Mint Linux or Bodhi??. tiny download for your verion of windows. ISO Recorder is a tool (power toy) for Windows XP, 2003 and now Windows Vista, that allows (depending on the Windows version) to burn CD and DVD images. When burning data image files, use the slow speed of the drive like 8x but not 40x or 52x, so that you don't have errors in the burned image in the disk. ps Puppy Linux for the ARM cpu is operating on the Raspberry Pi board and the Gooseberry Board and the MELE A10 Allwinner boards. Will be interesting to watch how the many tablet devices coming out of China can run Puppy ARM Linux and what interesting ways to use Puppy Linux. http://www.hardkernel.com/renewal_2011/products/prdt_info.php?g_code=G132342040298 ODROID-PC with sata interface and Ethernet. I'd like to use slacko puppy on my netbook acer aspire one 725. Running well and fast. But the problem is the temperature too hot. How solved this problem? Thank's. This morning I downloaded the lupu-528.005.iso file, burned it to a CD, rebooted my computer and there I was, … looking at the Lucid Puppy desktop. After introducing a few data and also my wireless network WEP-key and choosing Firefox browser (sorry for that) I found myself surfing the internet. All this took me less than an hour. Marvellous ! Thank you for your reviews. I'm far from an Everyday Linux User, but because I want to become one, I have a beginners question: I didn't save my first session because I'm not sure of what will happen with the partition I specify. Are all other files on that partition going to be deleted and do I have to create new partition? What will happen when you choose the partition is that a file will be created on that partition with an extension of .SFS. It is just like any other file on your computer. When you boot Puppy up again it will automatically load the .SFS file. It will not delete anything on the partition. Thx for your reply. Meanwhile, I've switched to Slacko on USB-stick. I am new to puppy. But I downloaded this Lupu 5.2.8 usb version, plugged it to my eee pc, and it works. Then I tried to connect to the internet (via EVDO modem) using the pupdial command from the console. I was successful in my first trial two days ago. But when I tried again and again yesterday, and also today, I failed. The promt said 'waiting for the carrier, OK, then nothing (or Dormant1)' something like that. I was wondering why, because the connection always successful when I connect through my other pc using windows xp. Could you help me with the problem? It has been many years since I used a dial up tool for connecting to the internet therefore I have not used the Pupdial tool that you are referring to. The best I can offer is links but you would be better off typing pupdial into Google and having a ferret around until you find your answer.